Abstract: Many important decisions are based on results from instrumental methods of analysis such as the price of goods, the compliance of products with legal requirements or the outcome of research based on chemical analysis. A measurement procedure can only play its role properly if the reported information is objective and has the required quality. The reporting of measurement with uncertainty makes information objective since it defines an interval that should encompass the expected value of the measured quantity with a known probability. Different strategies for the evaluation of the measurement uncertainty can be used. The “bottom-up” approach involves dissecting the measurement procedure in individual uncertainty components responsible either for random or systematic effects, the quantification of these components and the determination of the combined effect of the various components. This approach is difficult to apply due to the complexity of involved models. 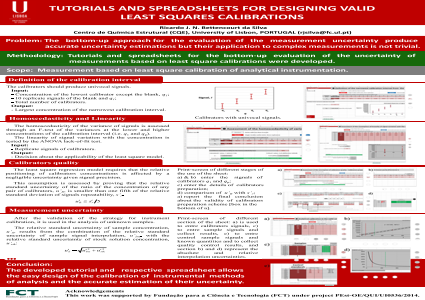 This work consists in the development of tutorials for the validation of quantifications performed by instrumental methods of analysis based on least-squares regressions. These tutorials include: 1) the definition of the Limit of Detection and calibration range, 2) the definition of the procedure for calibrators preparation, 3) the evaluation of the applicability of the regression model for describing the calibration curve and 4) the assessment of the measurement uncertainty using the “bottom-up” approach. The various stages are completed in a sequence of user-friendly MS-Excel spreadsheets. These tools were developed to be used by less experienced analysts and to ensure the production of sound metrological information. Summary: This work consists in the development of tutorials for the validation of quantifications performed by instrumental methods of analysis based on least-squares regressions. The various stages are completed in a sequence of user-friendly MS-Excel spreadsheets.